August 4th marks the birthday of Raoul Wallenberg, a man who single-handedly saved 100,000 Jews during the Holocaust. Museums around the world offer the opportunity to remember and pay tribute to his name on the day that brought him into our world, August 4, 1912. In 1944, at the age of 32, Wallenberg was appointed First Secretary at the Swedish embassy in Budapest with the mission to start a rescue operation for the Jews. Wanting to immediately get things done, he made sure that he would not be held back by the usual bureaucratic red tape. Upon arriving in Budapest, Wallenberg began issuing Swedish papers to as many Jews as he could, effectively protecting them from the Germans. At first, Wallenberg was only given permission to issue 1,500 of the protective passes. However, through promises and empty threats to the Hungarian foreign ministry, he succeeded in issuing thousands more. Wallenberg would chase after the deportation trains, climb on them, and hand out countless Swedish papers. He would then have the train stopped and order that those with papers be discharged. These papers were only one way that Wallenberg saved the Jews. He also built 30 “Swedish houses.” With his country’s flag waving from the door, the area was declared Swedish territory. In these houses, Wallenberg managed to hide 15,000 refugees. In January 1945, Adolf Eichmann, Hitler’s right hand man, planned a total massacre of the largest ghetto in Hungary. Wallenberg found out and sent a message to the man appointed to carry out the deed, August Schmidthuber, commander-in-chief for the German troops in Hungary. Wallenberg threatened and warned him that he would be tried and hanged as a war criminal if the massacre proceeded. It was called off and 70,000 Jews were saved. Raoul Wallenberg risked his life to rescue as many Jews as possible. Wallenberg was and will always remain a righteous gentile in every sense of the word. Today, it is impossible to accomplish what he did. We cannot turn back the clocks of history and save the victims from the iron clasp of the Nazis. But we can remember them. Through learning about the Holocaust, their names and memories will be etched in our hearts forever. Thankfully, today, it is not too hard to learn about the six million that perished. There is The Jewish Heritage Museum in New York City, Yad Vashem in Jerusalem, The United States Holocaust Memorial Museum in Washington, and countless others. The Jewish Heritage Museum, located in New York City, takes a holistic approach. It focuses not only on the Holocaust itself, but on Jewish life before and after. The first floor displays Jewish life at the start of the 20th century. One can explore the various different communities that existed around the world, their customs, and their social systems. After having seen all the exhibits on the ground floor, one has a distinct feeling of what Jewish life was like before Hitler entered the scene. The second floor then begins with the war against the Jews. It displays the anti-Semitic propaganda that spread like wildfire, and shows how the Jews fared in the persecution against them. It tells a tale of Jewish pride and the fight for survival. There are galleries in which one can sit and watch short films containing testimonials from those who survived the Holocaust. They talk about the evils they endured, while the pictures hanging along the walls bring their descriptions to life. Sadness is then turned into hope on the third floor of the museum. It focuses on Jewish renewal. It shows how life was rebuilt after the destruction, and how the Jewish tradition that Germany was hell-bent on crushing, flourished once again. With the establishment of the state of Israel and new communities sprouting worldwide, the Jewish heritage lives on. The U.S. Holocaust Museum in Washington takes a more concentrated approach, focusing only on the Holocaust itself. It also contains three floors, yet splits them up very differently. When touring the exhibition, one begins on the third floor and proceeds downward. The top floor displays the Nazi assault, from their rise to power in 1933 to the outbreak of World War II in 1939. It explains how Germany, as a totalitarian state, with its propaganda, violence and state-sponsored racism, not only allowed but encouraged the persecution to escalate. These themes are addressed in the two films that play: The Nazi Rise to Power and Anti-Semitism. The middle floor centers around the “Final Solution”, during which persecution evolved into mass murder. From 1940 to 1945, six million Jews were killed. The floor presents images from the ghettos and concentration camps, as well as artifacts including mounds of confiscated glasses and shoes. One can walk through an actual railcar that transported the Jews and see one of the bunks from the Auschwitz-Birkenau concentration camp. 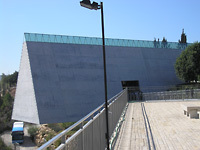 The liberation of the camps is shown on the bottom floor. It addresses the Allied victory over Nazi Germany in 1945 and the condition in which the Jews were found. Films include footage of survivors’ sharing their experiences. In addition, there is a wall that pays tribute to the thousands of men and women throughout Europe, like Raoul Wallenberg, who risked their lives to save Jews. Portraying the rebuilding of the Jewish spirit and the quest to bring those responsible to justice, the final floor of the museum brings hope and restores faith in the goodness of people. 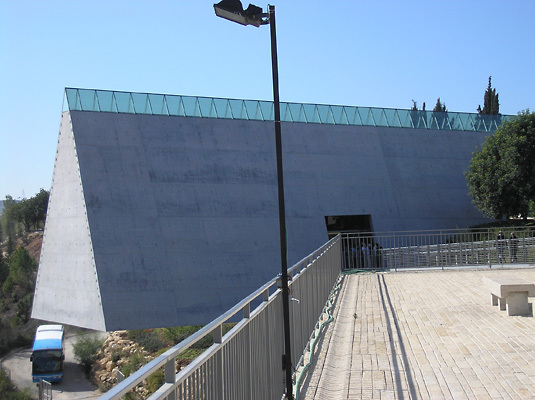 Yad Vashem, located on the outskirts of Jerusalem, takes a more hopeful approach. It focuses on the immortality of the Jewish people. While telling the same tale of persecution and terror, the emphasis is on Jewish pride, determination and survival. The architecture features countless skylights, which create a brilliant effect of shafts of light shining through the darkness. Its Hall of Names pays tribute to every single Jew who perished in the Holocaust. The 10-meter high dome-shaped ceiling displays the photographs of 600 victims, while over 2,000 “Pages of Testimony”, short biographies on each victim, are stored along the walls. There is also a separate children’s memorial in which the 1.5 million who perished are remembered. The memorial is hollowed out from an underground tavern; the space is completely dark and memorial candles are reflected off the walls and ceiling, creating the impression of millions of shining stars. In the background, the names of the murdered children, their age, and their country of origin, are announced. The heartbreaking experience is softened by a walk along the “Avenue of the Righteous Among the Nations”, where trees have been planted to honor the virtuous rescuers. Raoul Wallenberg’s tree stands amid the gardens. For him, his colleagues, and most importantly, for the six million that perished, the museums exist.